Publisher (also called an affiliate) is the company specialized in bringing the buyer’s products and services to a wider audience. With the help of various sites, publishers find Internet users that are interested in acquiring certain product or service and leave contact details for the communication with a potential provider. To create a new publisher, follow these instructions. To view the list of all Publishers in the platform, go to Admin -> Publishers. Publisher management spreadsheet can be sorted by several columns. Click the corresponding column heading to sort the spreadsheet down, click one more time to sort it up. 1. Publisher shows the name of the publisher. 3. Margin – the margin percentage set in publisher settings (default margin is 85%). 4. 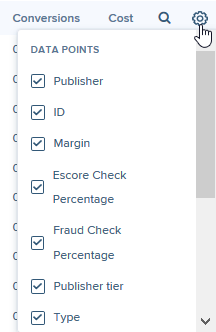 Escore Check Percentage - the percentage of leads from this publisher, that is checked by verification services configured in PX (eBureau, Neustar, etc.). 5. Fraud Check Percentage - the percentage of leads from this publisher that is checked by verification services configured in PX (eBureau, Neustar, etc.). Read more about Fraud Score. 6. Publisher Tier - lead quality categories (Excellent, Very good, Good, Fair, Below average, Poor). 7. Type – publisher type depending on how leads are captured (Mobile, Call Center, Search, Email, Premium Display, Path, Contextual, Mobile Premium Display, Offer Wall, Mobile Path, All/Mixed or Undefined). 8. Access Mode - the mode that indicates when this publisher should be paid. 9. Add Upsell to Balance - indicates whether the revenue received from Upsell Leads is added to the publisher’s balance calculation (Yes or No). 10. Fixed Pricing shows if the fixed price is paid to the publisher for each lead (Yes or No). 11. Clicks - the number of clicks of the publisher for the current date. 12. Conversions - the number of conversions of the publisher for the selected period. 13. 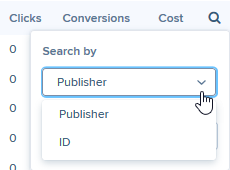 Cost - the amount of payout from PX to the publisher conversions for the selected period. Edit button links to publisher settings page. Payout Rules link to payout management of this publisher. 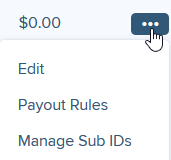 Manage Sub IDs option allows editing the list of the publisher’s sub IDs and their settings.